If you’re obsessing over keywords that you’re researched and used in your SEO strategies then you need to realize that you’re sweating over nothing. Well, not totally nothing but over keywords you think are going to bring to to the top of the search engine pages for greater exposure and more traffic. In reality, keywords aren’t the goldmine they used to be. It’s more of the way the keywords are used as well as the ‘shot in the dark’ keywords that you didn’t even know you were using. Here’s the deal. If you’re a dressmaker and you want to rank high for ‘wedding dresses’ or ‘top fashion dresses’, then your chances of reaching the most top positions on the search engines are scarce at best. Why? Because the bigger stores have spent tons of money, some of them in the millions for the top keywords. However, this doesn’t always mean success. Keywords are one thing, long chain keywords are another. Let us explain how this gets more complex but more simple. Going after popular keywords is fine but you can’t stop there. 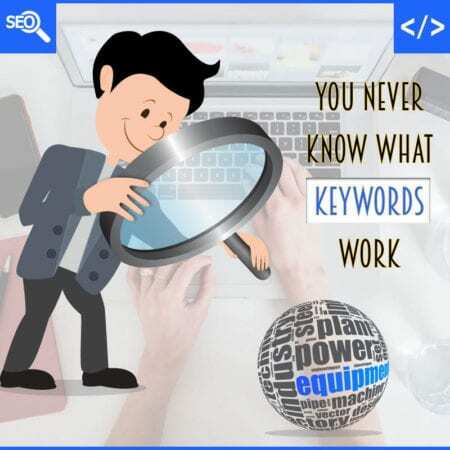 It’s a double shot effort to not only get traffic from those top keywords but also pulling in traffic on other copy that can automatically turn into popular keyword or keyphrase sentences that you didn’t even know you had. For example, let’s say your dress company is vying for the top keywords ‘popular dress fashions’. You get some traffic but when you check your stats you find out that you’re also getting traffic for keywords related to your location, the names of your staff and customers or even keywords regarding the blog post about your German Shepherd dog that appears in some of your photo shoots. Why is this important? It’s because no matter what you write about you are automatically creating keywords, keyphrases, and keygroups. They might not be blasting out to the public that you’re selling dresses, but they attract attention to other topics that then leads to the fact that you’re selling popular dresses. It’s like lead in traffic by default. Let’s say someone is asking Google if they should bring their dog or German shepherd dog to their wedding. Lo and behold there is your website’s blog post about you bringing your German Shepherd dog to your shop and posing near the wedding dresses. Suddenly that blog post reminds the surfer that a wedding is coming up for themselves or a friend or relative and they send that link to them. That link gets posted on social media, is shared, liked, and commented on. All of a sudden your at the top of the search engine pages for unrelated keywords but it still boosts traffic, makes you popular and converts into sales. Maybe not as much as your prime keywords but it’s free conversion anyway. See how this works? Just being natural and creating diversified content that is well written automatically turns into default keywords that can lead into sales. This is why you need to hire a professional SEO company. They realize this and will know that when your stats show a sale, it has to be traced and exploited. If it’s words that relate to your location, that is Local SEO and the expert can modify your SEO campaign to exploit this. If the sales come from unrelated data like your political comments or sports or celebrity comments on your blogs or main site copy, then they will know that somehow, someway you’ve stumbled upon a new keyword or keygroup or keyphrase that is pulling in the traffic and that a certain percentage are turning into positive gains. Affordable SEO Florida is just the right SEO company that understands this and will keep you on a steady course to keyword prosperity.